In the old days, when you wanted to improve your Wi-Fi performance, you’d grab yourself a dual-band router to break up your devices according to 2.4GHz and 5GHz clients. These days, it’s all about triple-band routers. You want more performance? Get yourself a D-Link AC3200 Ultra Wi-Fi router (or DIR-890L for short) with tri-band support and you’ll effectively double your 5GHz throughput. Essentially, the D-Link is a dual-band router (2.4GHz and 5GHz), but it actually has two 5GHz radios installed, and this allows you to run two 5GHz networks on the same router, and without compromise. The breakdown of its AC3200 rating is as follows: 600MHz for the 2.4GHz, 802.11n network; 1.3GHz is for each of the two 5GHz, 802.11ac networks. This high rating is beneficial if you live in a household that has more than a handful of devices running on its 5GHz network at the same time. Instead of saturating the one 5GHz network with all those devices, you can double up the 5GHz network and share the load across the router’s ‘third’ band, assigning some to one SSID, and others to a second SSID. Meanwhile, you can keep slower devices, such as a Chromecast, on the 2.4GHz network. It’s a nifty solution for high-throughput-seeking users, and it worked perfectly during our tests. We tested the router in our usual environment: NAS devices from Asustor and Synology were connected to the router via Gigabit Ethernet, and a selection of large and small files were transferred to our standard laptops (a Lenovo ThinkPad Yoga, and a Lenovo Yoga 3 Pro) from close range (up to 3m) and from a mid-range distance (up to 15m). For this router, we transferred files to two laptops at the same time, from the two different NAS devices (one to each laptop), using the two 5GHz networks (one laptop on each network). The results were stunning from close range, with the two laptops combining to give the router an average wireless speed of 88.9 megabytes per second overall. The first laptop averaged 48.13MBps to transfer 6.2GB worth of files, and the second averaged 40.77MBps to transfer 7.3GB worth of files. Remember, these are figures that were achieved while both laptops were transferring files at the same time, meaning we could copy 13.5GB in just 3min. However, the files we used were different for each transfer (the Yoga 3 Pro laptop transferred 1GB more), which could account for the slightly slower rate of the Yoga 3 Pro laptop, though it also uses a Broadcom 802.11ac Wi-Fi chip, rather than an Intel Wireless-AC 7260 chip (which is in the ThinkPad Yoga laptop). We used different files to keep the test as ‘real-world’ as possible, figuring it would be rare for users to access the same files at the same time, though we understand that using two NAS devices probably isn’t typical of a real-world scenario either, unless you live in a household that is especially tech-heavy. When you look at its specifications, you might be blown away to find out that it includes a 1GHz, dual-core CPU. It needs that much grunt to drive the 2.4GHz and twin 5GHz networks. Furthermore, you can plug in a hard drive to share over your network (easily access it via the mydlink SharePort app on a mobile device), and you can use the router’s neat Web interface to make swift changes to its configuration -- even over the Internet if you enable remote access. In our single laptop, 5GHz, 802.11ac transfers, using the ThinkPad Yoga, the speeds the router hit were fast. The short distance tests recorded 44.93MBps for large files (the peak being 48.9MBps) and 30.47MBps for small files (the peak being 41.9MBps). Over the mid-range distance, the large files averaged 20.52MBps, while the small files averaged 18.64MBps. Large file performance is a step up over the last D-Link router we reviewed, the Viper AC1900. In fact, the only time in which the AC3200 was slower was when undertaking the close-range, small file transfer test -- though only by 2.51MBps. For another reference point, the AC3200 was faster than TP-Link’s Archer C9 AC1900 in all tests. Transferring large files (6.2GB worth of movie files) across a 3m distance. Transferring large files (6.2GB worth of movie files) across a 15m distance. Transferring small files (8.4GB worth of MP3s and FLAC files) across a 3m distance. Transferring small files (8.4GB worth of MP3s and FLAC files) across a 15m distance. We’ll also note that the router was working on other things in the background while we conducted all of our tests. In particular, it was streaming content from Netflix through a Fetch TV set-top box connected via Gigabit Ethernet. Six high-gain antennas are the avenues through which the frequencies fly, and SmartBeam technology is supported so that these frequencies can hone in on your devices with more focus, rather than aiming the beams in general directions. We’re quite pleased with the results that we achieved in our mid-range distance tests, with the rates being consistent throughout, and a little better than what we’re used to seeing. In fact, D-Link has shown us to be quite a good brand to consider if you want reliable performance over longer distances. Couple it with the very fast short-range results, and you’ve got yourself the best of both worlds. Setting it up was as easy as it gets as far as the configuration is concerned, but the physical set-up was a little more challenging. The size of the router is gargantuan by home router standards, and you might have to move furniture around to make it fit in your desired location. For us, it was a matter of clearing space next to our TV in an apartment environment, and positioning it in such a way that the antennas didn’t impinge on the screen itself and obstruct our view. If you’re really keen, you can wall mount it instead. The shape of the router stands out as something that’s perhaps a little ahead of its time, or perhaps something that’s already been and gone: it has angular design that makes one reminisce about the Boxee Box media streamer, which was the vendor’s first product to use such an angular design. This router is a little flatter than that, and of course it has the significant antenna action around the sides. We think it looks great, and it can make for a good talking point for visitors who see it and wonder why you’re using it. You can go into all the details of the performance you’re gaining on the 5GHz network. As far as Cloud features are concerned, you can associate this router with a ‘mydlink’ account, giving it a dynamic DNS address through this service. This will allow you to access the router at any time over the Internet by using the myDlink+ app on your smartphone. Through this app, you can check up on the devices that are connected to your network, have a look at network activity, and also enable and disable remote access at any time. In fact, it’s an especially useful app to look at when you want to access your router remotely via a Web browser. Simply enable remote access, and punch in the IP address of the router that the app displays in order to bring up its login page. Be sure to actually change the default admin password for the router to something that’s impossible for people to guess. Features that are present in the Web interface include QoS management (you can drag and drop devices into a chosen priority), VPN, Web site filtering, and static routes. 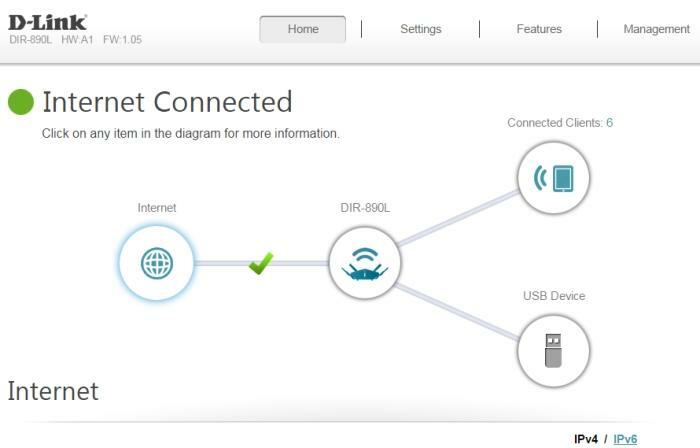 It’s a neatly laid out interface that we first saw in D-Link’s AC1900 (DIR-880L) wireless router, and we think it’s one of the easiest and quickest wireless routers to set up. Our only quibbles: it could use better descriptions on how to use some of its features, and that it logs you out of the interface rather quickly. We couldn’t find a setting to change the login period, which means you have to be quick when changing settings. It has a neat interface that's highly intuitive. Our overall impression of this router is that it’s a great choice for a super-busy home. Plus, it wasn’t only fast across short and mid-range distances, it was also reliable. We ran it continuously for one month and never had a need to reset it, or even to venture into its interface after our initial setup. It worked flawlessly with our TP-Link modem plugged in -- our iiNet ADSL2+ connection stayed up completely during our test period, which helped. The style isn’t suitable for all, but it will probably highly appeal to the demographic in its crosshairs: performance seekers and hardware enthusiasts.